Explore the best of Abu Dhabi in this day tour of the Arabian Jewel. Visit the Sheikh Zayed Mosque, discover life at the Heritage Village and complete the experience with the Ferrari World. Experience the highlights of Abu Dhabi, the capital of the United Arab Emirates, from Dubai. Have a glimpse of the Jebel Ali Port (largest man-made port in the world), visit the Sheikh Zayed Grand Mosque and Sheikh Zayed center, stroll around the Heritage Village, and drive along the stunning Corniche and Saadiyat Island, future home of The Louvre Abu Dhabi, Guggenheim Abu Dhabi, Zayed National Museum and more. Don't miss out on the opportunity to explore the city's famous Ferrari theme park on the same day. Choose the tour package with a Ferrari World entry ticket to have a fun and exciting experience the Ferrari way. Drive to the outskirts of the city to visit the key site of worship in all of UAE, the Sheikh Zayed Grand Mosque. Admire and learn about the great architecture of this mega-structure which was constructed as a tribute to the late president of UAE. Visit the Sheikh Zayed Centre, a museum that houses personal memorabilia of Sheikh Zayed, known as founding father of the Emirates. Get a full view of Abu Dhabi from the man-made barrier. Enjoy the views of the magnificent skyline that is a popular spot for photo shoots. Explore one of the best cultural attractions in Abu Dhabi, the Heritage Village. Catch a rare glimpse into the Emirates' rich historical heritage. Take your time to explore the shopping mall on your own and enjoy lunch at the restaurant of your choice. Please note that the guide will not accompany you back on the bus after your lunch break. Pick-up and drop-off services are available for some specific hotels only. Guests staying at hotels not included in the list will be guided/directed to go to the nearest available hotel for pick-up. Great for those with a long layover in Dubai! - Please leave large luggage in your hotel or airport in advance. - Airport transfers are not available. - You will be sent a confirmation e-mail at least 4 days before the tour date. Please print the e-mail and bring on the day of the tour. - Please check online or with your embassy to see if a Visa is needed in advance to enter the UAE. For smoother processes during immigration, it is advised to purchase your Visa online if needed. Random eye screenings and Visa validity may be spot checked at the airport. Please put that time into account before booking this tour. Upon arrival, exchange your Ferrari World VELTRA voucher from your guide to the ticket counter of the amusement park. Enter the Ferrari World Abu Dhabi with your bronze ticket. Please note that you cannot exchange your voucher for the ticket at the standard ticket counter. This is the first Ferrari-themed park in the world! Spend your time exploring the fun attractions and watch amazing shows. Meet your driver to return to the city center. Pick-up location (specific hotel) cannot be changed 48 hours before tour departure. Participants who wish to join the tour on the day of their arrival to Dubai should arrive in Dubai at least 4 hours before the tour departure. The airport gets extremely crowded during the end of the year to the beginning of the year. Please understand that bookings will not be accepted for those arriving in Dubai during that period. Visible tattoos are not allowed. 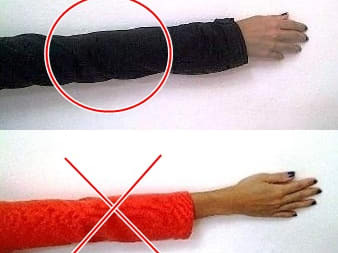 The Grand Mosque imposes severe clothing restrictions. Please refer to the sample picture below and be prepared with clothing suitable for admission. If clothing does not meet the standard, you cannot enter the mosque and cannot get off the bus. Abaya or scarf rentals are not available. Dress code for Men: Avoid clothing that exposes the knees. Sleeveless shirts and shorts are forbidden. Make sure your shoulders are covered and pants are three-quarters length. Dress code for Ladies: It is necessary to hide all of your hair including your bangs. Please cover your hair with a scarf. 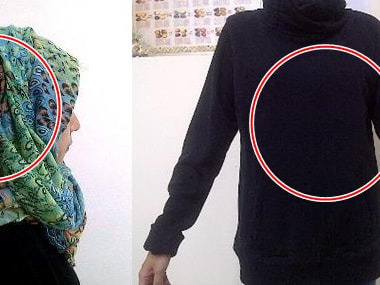 Dress code for Ladies: Aside from the neck and hands, you may not show any skin. Loose fitting long sleeved shirts are recommended. See through clothes or tight fitting clothes are not permitted. Dress code for Ladies: Aside from the ankles to your feet, you may not show any skin. 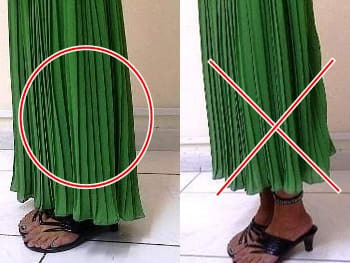 Loose fitting long skirts or long pants up to the ankles are recommended. 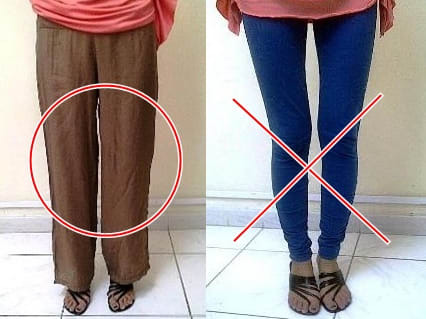 Slim pants and leggings are prohibited. Please wear loose pants or long skirts. Please make sure your clothing covers your ankle or else you will not be allowed entry. 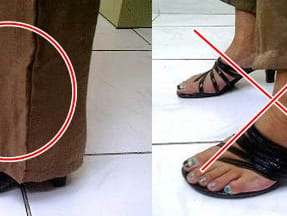 It is recommended to use shoes that are easy to take off since they will be asked to remove before entering the mosque. Abayas are available for purchase at a limited supply only. If children under 3 are attending, please have a form of ID such as a passport to show. If you do not have an identification with a birthday for the child, an additional child fee may be required at the Ferrari World. Your guide will be giving you a voucher to exchange for a Bronze Ticket at the Ferrari World. Upon arrival, go up the escalator, go through security, and go into the room with glass doors on your right hand side to exchange your voucher for a Bronze Ticket. Please note that the standard ticket counter will not exchange your voucher for a Bronze Ticket. Large luggage (suitcase and big backpacks) is not allowed on the boat. Please leave it in your hotel or airport in advance. Pick-up times are not fixed nor final. All departure times are estimates and may vary up to a couple of hours depending on season/hotel location/traffic conditions. Exact pick-up time and location will be advised upon confirmation with the service provider at the destination. Guests will not be accompanied by the tour guide on the return to Dubai. This tour may have participants of mixed nationalities, guests may be guided in multiple languages other than English. Please be on time. If you are more than 15 minutes late for your pick-up or the ship boarding time, the tour will operate without waiting. Airport transfers are not available, please proceed to the meeting location at least 15 minutes prior to departure time. Participants who will join during transit in Dubai will be sent a confirmation e-mail at least 4 days before the tour date. Please print the e-mail and bring on the day of the tour. Schedule (arrival time and length of stay) at Ferrari World will depend on the tour condition on the chosen date. Please understand that your time at Ferrari World may be shortened due to traffic or longer stays in the city. Any cancellations made after 07:30 local time, 2 business days prior to the activity will be subject to a charge of 100% of the total amount.